I was thinking about how little poets seem to matter to modern political administrations. Maybe to modern society as a whole. Their light has, it seems, been waning for several decades as our collective attention shifts. I was thinking about what an odd, awkward fit it would be for a poet to be invited to today’s anti-literacy White House. Would he or she have to start each conversation with the question “Have you read…” dreading the answer would be a blank stare, a silent shake of the head and the turning of eyes to smartphones and TVs blaring Faux News. Many Americans’ exposure to poetry today is limited to inspirational snippets on fridge magnets or a few verses recited every four years when a poet is trotted out at a presidential inauguration. But that’s only true for Democratic presidents. Republicans shy from poets. At the Trump inauguration? None: just a handful of wannabe celebrities, some sycophants and has-beens. No poets, no authors, no reading, no evidence of culture deeper than the superficial. Not even as good as a single episode of America’s Got Talent. Thus is the new world of politics: reduced to a small screen and a handful of words. No deep insight, no big reads. Is poetry disappearing from our lives? Sublimating to texting, Twitter, Instagram and such platforms that require little to no thought, but demand instant response and mindless reaction? So begins the poem, The Lion and Albert, written by Marriott Edgar. I first read it in the book pictured on the right: a book that accompanied a collection of 78 rpm records in which Stanley Holloway read the poems (click to see a larger image). I was perhaps nine or ten years old when I first found them in the family collection of 78s, along with the book of 12 poems and their drawings. We had an old, hand-cranked 78 record player in the basement and I used to go there and crank it up and listen to the scratchy old records. I loved them. Holloway at that time wasn’t known to me from any other performance. He wouldn’t appear in the film My Fair Lady until 1964. But I delighted in his voice and from him I learned a bit about British vaudeville, burlesque and even about the era of the Pearly Kings and Queens. I used to parade around in my basement, swaggering, shouting out the words of the poems and monologues that I soon memorized. “With ‘er ‘ead tucked underneath ‘er arm…” about Anne Boleyn was one of my favourites. “Sam, Sam, pick oop tha musket Sam…” was another. That was then. Somehow, over the years, I lost track of the book, forgot the sounds and the words. We moved from the house to a smaller apartment in 1962, and the old 78s and its player vanished, probably tossed away or given to neighbours. As I reached my teenhood, other fancies and interests took hold. I didn’t even think about them until many decades later. When my parents died, I ended up with some of their belongings. 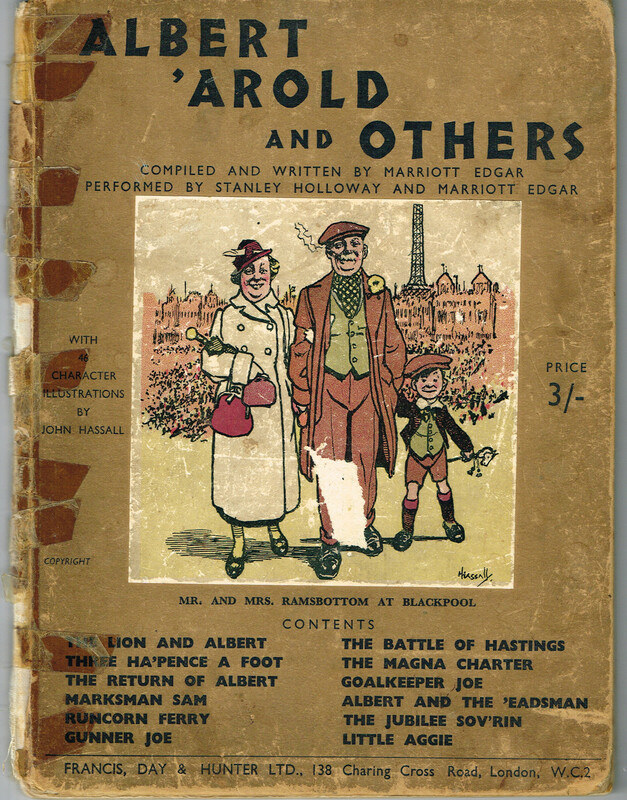 Among them was a thin, battered, old book: the “libretto” for those Stanley Holloway records. A book I had read and reread many times in my childhood. Taped and retaped, it has been in someone’s closet or drawer probably every since I last looked at it. It’s the same one you see here, in the scan of the cover. It was published in the 1930s and was my father’s. He brought it to Canada, likely when he emigrated from England, in 1949. It’s one of the few things I have left of him. Profanum vulgus. The vulgar crowd. Not, however, as you might suspect, an apt description of the remaining few supporters of The Block that rules Collingwood Council. While perhaps appropriately described, to me that small handful are better described as naïve, gullible and even intellectually vulnerable, moreso than merely vulgar. But that’s not what this post is about. I sing a song for young women and boys. justice: the roomy urn holds every name. The poem is really about the equality that death brings everyone and the pointlessness of our base pursuits. That roomy, capacious urn at the end of the line is where we all eventually end up regardless of our status and wealth. Horace also contemplates how little riches and rank offer in comparison to his small Sabine farm, and says how content he is with his lot. But as usual, Horace isn’t that simple; the poem has more to contemplate than just one notion. I’m trying to understand it all and the choice of words in the translation matter. To err is human. And bureaucratic.